"This is so much more pleasant than traveling with a stranger…" Samuel Goldwyn Films has released an official trailer for the film Youth in Oregon, an indie drama about a son-in-law who takes on the task of driving his nearly-80-year-old father-in-law across the country to Oregon to be euthanized at his request. Frank Langella stars as the old timer curmudgeon who just wants to wrap up his life, and Billy Crudup co-stars as his son-in-law who drives him across the country and attempts to change his mind. The full cast includes Christina Applegate, Josh Lucas, Mary Kay Place, Nicola Peltz & Rebecca Blumhagen. I'm always impressed by Frank Langella, he's an excellent actor, and it's nice to see him in interesting roles like this. If fellow critic David Ehrlich says it's a highlight of Langella's career, maybe this is worth seeing. When 79-year-old curmudgeon Raymond (Frank Langella) makes arrangements to be euthanized in Oregon, his family refuses to accept his decision. But when another family emergency arises, Raymond's daughter Kate (Christina Applegate) turns to her husband Brian (Billy Crudup) for a little help. So Brian reluctantly volunteers to drive the cantankerous Raymond and his wine-loving wife Estelle 3000 miles to Oregon. Determined to change the old man's mind before they reach the Beaver State, it becomes quickly apparent to Brian that convincing your father-in-law to keep living when he's ready to check out is no simple task. 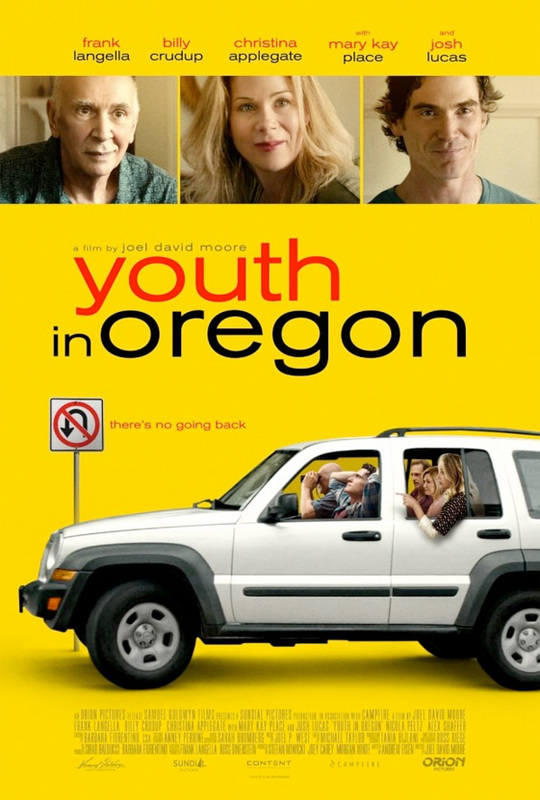 Youth in Oregon is directed by actor-filmmaker Joel David Moore, of the film Spiral and a few shorts previously. The screenplay is by Andrew Eisen. First premiered at the Tribeca Film Festival last year. Samuel Goldwyn Films will open Youth in Oregon in select theaters starting February 3rd. Anyone? Looks like a better version of LITTLE MISS SUNSHINE. Frank Langella is like a slightly grumpier version of my neighbour. Past 80, I'm not sure that I'd be that up for living either, unless they've invented pensioner mechas by then. May check this out. Looks like it might bring the tears. Pensioner mechas?!? HAHAHA! Now THAT is a movie I would watch! "Youth in Mechas" where the elderly or terminally ill suit up to battle to their death!